According to the National Fire Protection Association (NFPA), and many local municipal codes, it is necessary to have the fire and sprinkler systems in commercial buildings tested periodically. Most cities and towns state this as a requirement to have occupancy. Picking an experienced, reputable company, who employs certified and trained fire testing personnel, is important. When hiring a fire alarm system or fire protection testing provider, consider a company who can perform the service with the least interruption to your business. Safe Systems can schedule these services around the critical hours of operation for your business. We are a one stop shop that can inspect all fire systems, sprinklers, backflows, and extinguishers, keep track of when everything is due, and provide quality detailed reports for your records. Safe Systems provides excellent customer care and has vast experience testing all types of commercial properties including schools, banks, and manufacturing sites. We have been proving the value of our expertise for 48 years. Fire devices regularly inspected reduces the risk of malfunctioning in the event of a fire. 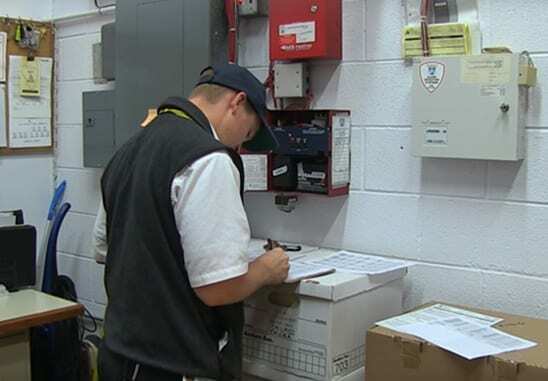 Our technicians take it upon themselves to inspect each and every fire detection device in your facility. They also perform tests according to local regulations. Safe Systems fire technicians are licensed to inspect and test any fire panel and document it regardless of the product or code type. During a scheduled fire inspection, a technician arrived at the client’s site and determined the system was down. Due to the fact that it was an older model of a fire panel with proprietary codes, the technician brought in the team leader and manager to assess the situation. Before doing any action, he notified the client about the current situation and recommended a solution. Within 24 hours, we installed new fire panels and fully reprogrammed the system at no additional charge to the customer. The panel was covered under our service repair plan. Contact Safe Detection Systems at 1-800-446-7519. We are the largest privately-held security provider in Colorado that offers fire and sprinkler testing and believe we can save you money!